In the early 1980's the English artist David Hockney made a series of very distinctive images using the Polaroid SX-70 instant colour camera. Hockney had hit upon the idea of using the fixed lens of the camera and the white frame of each print to create unique photo montages, or joiners as he called them. Each of the joiners is a single composition that is created from dozens or hundreds of individual Polaroid prints. The separate Polaroid's are stuck together and the frame around each image is left intact. The combination of multiple white frames, when butted up together or overlaid with multiple other Polaroids, creates a grid. This grid is therefore an integral part of the way the joiners are created. Why did Hockney, a famous painter, choose to create images that are far from painterly? Perhaps the best of the joiners is a piece called Noya and Bill Brandt with self-portrait, Pembroke Studios, London, 8th May 1982. A combination of the Hockney joiner of Bill & Noya (right) and a stripped down version (left). This version shows just the grid squares that are filled with images of Bill's hands. The grid squares that contain images of either Bill or Noya are shaded dark grey - grid squares without are shaed light grey. The grid squares can be referenced with an alphanumeric code (E3 etc). Original image copyright Hockney. 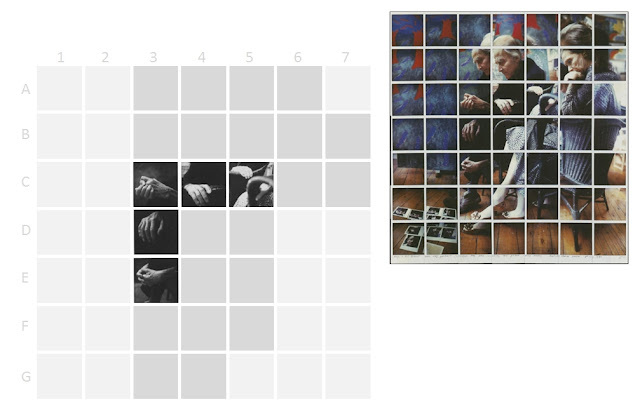 How does the grid interact with the scene that Hockney has posed? The grid is completely regular, each Polaroid is laid out so that it butts up to its neighbours, right and left, and it overlaps the Polaroid above it so that there is a completely regular grid of negative space. Within this grid each image is independent. The overall composition is simple, Bill and Noya are elderly people sitting down together side on to the viewer. They are looking down at a set of black and white “self portrait” Polaroids on the floor, which is made of bare polished floorboards. There is a large canvas in the background of the image. The image is composed of a square grid made of 7 x 7 = 49 square frames, each of which is a Polaroid image. By definition the images cannot be captured simultaneously so the image captures time - and not necessarily a linear increment of time between pictures. Hockney has created within this fixed two dimensional grid elements of 3 dimensions, space and time. Some features of note. Bill's head appears in four of the frames all in a square and all indicating his head has moved during the capturing of the composition but it is staring down at the self-portraits over a period of time. Noyas head appears in just two frames and the overwhelming feeling is that she has been staring steadily in the same direction, quietly and in deep thought, over the course of the capture. This may have been true or not - but it is Hockneys selection of the frames that projects this feeling. 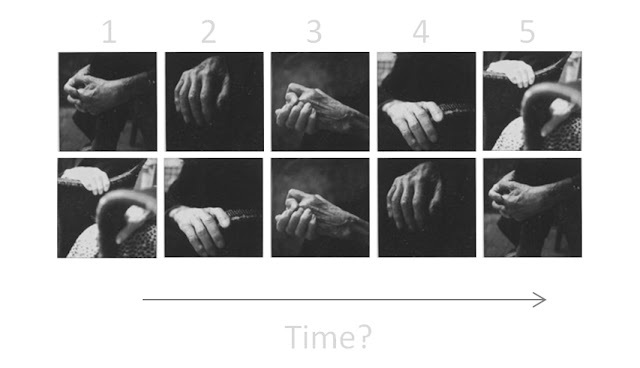 Bills hands appear in five frames and they show a real dynamic over the time course of the capture. These hands express what Bill thinks of his self portrait. His hands indicate as we read bottom left upwards and rightwards that he is engrossed then relaxed then held in rapture. Because time is not displayed in a linear sequence we cannot infer dynamics - for example consider the 5 images of Bill's hands (E3, D3, C3, C4, C5). Depending on cultural preference we can "read" this unordered sequence from bottom left up and right or the opposite or the reality may be that the sequence is not as simple as that. The images of Bill's hands, laid out as time series. The top series implies that Bill had begun with his hands clasped around his shins and he steadily moves his hands up his body and at the end is sitting back in the chair. The bottom series implies the exact opposite. Neither may be true - and the use of the two dimensional grid of frames leaves completely open this ambiguity. The two dimensional grid has no implied time direction, yet real dynamism. All we know is that Bills hands had been at some part of the scene capture in these positions, perhaps the bulk of the time Bill's hands were as in E3 and only fleetingly have they been in the other dispositions. These multiple views of Bill's hands, arranged in a dynamic sequence as a subset of the two-dimensional grid, bring enormous life to this scene. This is not a video installation, no pictures are moving. Yet it is not a still life. There is dynamism and movememt in the still image. Hockney has cleverly captured, stretched or compressed and manipulated the time sequence and set of focal lengths into this dynamic image. It is also worth noting that Bill and Hoya seem to occupy much more of the area than they would do if it had been a single image (25 of the 49 frames are occupied by Bill or Hoya, they are shaed darker grey below). Cameraworks. Photographs by David Hockney. Text by Lawrence Weschler. Alfred A. Knopf, New York, 1984. The negative space in this joiner - the white edges to the Polaroids, that have been preserved in the composite are an integral part of this photo montage technique. If all the white edges had been removed the composition would be completely changed. Although each image in the frames are naturalistic - they are untreated Polaroids after all - the overall image is a dynamic image with pace, rhythm and life.